By Br. Pier Giorgio Dengler, O.P. 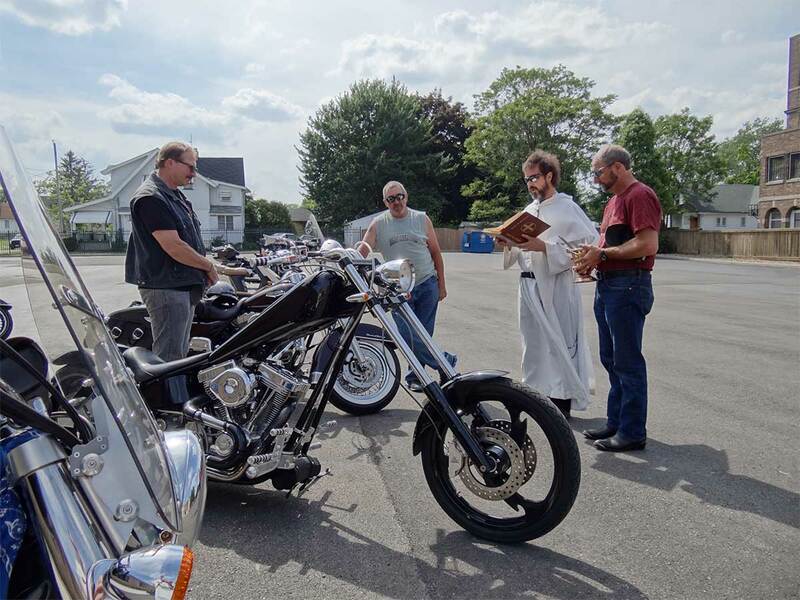 Even though Saint Columbanus or Saint Frances of Rome are the patron saints of motorcyclists, you’re far more likely to see Saint Jude riding a Harley – generally on a biker’s bicep. With the exception of Jesus himself and his Blessed Mother, Saint Jude is the saint most likely to appear on tattoos. Maybe this has to do with Saint Jude’s penchant for bling – he is usually depicted wearing or holding a huge medal bearing the image of Jesus. As the patron of “hopeless cases,” of lost causes, of the impossible, many of us embrace devotion to Saint Jude when we are most desperate, when we cannot outrun or out-ride reality’s most dreadful grief. Saint Jude offers hope to the hopeless, a ray of light to those most beset with darkness – he offers nothing less than Jesus himself. Yet why should only Saint Jude be shown holding the image of Christ? Holding a medallion recalls the question he asked Jesus in the gospel: “Lord, what has happened that you will reveal yourself to us and not to the world?” (John 14:22). Essentially, Saint Jude asks Jesus why he is not manifesting himself to everyone in the world at once; why Jesus is choosing to allow the relatively small number of apostles to get to know him, and then rely on them to spread the word about who Jesus is. Indeed, it would seem that a simple media blitz, broadcast to everyone in the world would be the most efficient way to let everyone on earth know Jesus. Why shouldn’t Jesus have come in the current millennium, at a time when he could broadcast the Beatitudes over Twitter or post a photo of his Transfiguration to Instagram so that everyone would get the point already? Because this could never suffice. Jesus’ answer makes it clear why this could never be enough to save actual souls. He clearly states that what is necessary is love, and that he will in fact manifest himself to any and all who love him. Mass media can have an image blanket millions of screens in a matter of seconds, but only a person can give and receive love. Only personal witness can reach hearts and present Jesus in a way that inspires love. Only the Incarnate Word, who speaks with love in a heart-to-heart dialogue, could begin to put a creature in touch with the Creator. Our heart must be touched, and touching requires a personal contact. Touching reaches a particular person, in a particular place and circumstance – it is perfect for the way God loves an individual sinner. Like a tattoo, God’s touch considers the contours of our individual person – His grace comes tailor-made to our individual weaknesses, strengths, needs, and gifts. Yet all the while calling us to something more: inviting us to find our final end in himself. As with tattoos, his grace penetrates below the surface and leaves his image under our skin. And like Saint Jude with his mega-medallion, we must bear the image of Jesus to others – they should recognize us when they see us showing off Christ. Let us pray that we embrace the call to “put on Christ” (Gal 3:27), that through the imitation of Jesus we might “keep [ourselves in the love of God and wait for the mercy of our Lord Jesus Christ that leads to eternal life” (Jude 1:21).